Dallin Draper has never been to the East Coast. But, soon enough, the Delta (UT) High senior will get his toes wet in the Big Apple. "The whole thing will be a new experience for me," Draper said. 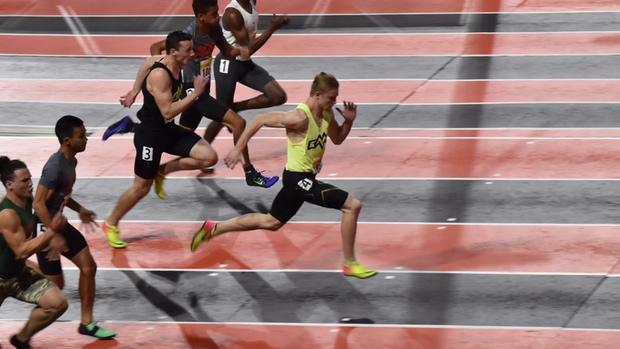 In March, he's headed to New Balance Nationals Indoor to see what he can do against some of the best sprinters in the nation. And in some ways, he will be stepping outside of his pond and jumping into a much, much larger one. "I'm feeling really great about it," said Draper, who signed with Brigham Young University during the early signing period. "When I came into the season, I wasn't super familiar with 60m times or what was really good. But after this season, I know now." Draper, a talented football player who has rushed for over 3,000 yards over the past three seasons for Delta, has been downright dominant this indoor campaign, lowering his career best 60 meter dash to 6.76 seconds, an improvement by a hundredth of a second from 2017 that's given him a US No. 6 mark. He's also consistently hit on stellar efforts at 200 meters, dropping under 22 seconds in three out of four performances in 2018 -- as a junior, he had none over his indoor season. At BYU, he's sticking to track. And why not? It's been one of those seasons for Draper -- the kind that has opened his eyes to boundless opportunities. He thought to himself recently. Why not New York? "At the very beginning of the season before I ran, me and my club talked about running at New Balance," Draper said. "But after I ran that 6.79 (60m), I saw where I stacked up. And I said, 'Oh yeah, we're definitely going to run now." Surprises happen every season at every distance. Draper is the latest -- though not even the only one in 2018 -- sprinter to position himself among some of the nation's best. Regionally, he's always been good. He's won three outdoor state championships in Utah, including two consecutive in the 100m, with a personal best of 10.61 seconds. Indoors has typically seen him finish his season at The Simplot Games. Over the past three years, he's won three championships in the 60m and 200m. You only get so many opportunities to race in national meets, though. Draper wanted to jump on his chance. "I'm super excited to run at the Armory," he said. "It's a really nice track." Draper's light bulb moment can at the BYU High School Indoor Invitational. He ran 6.79 seconds in the 60m to finish first. It gave him a new US No. 1 mark at the time. Later, he ran under 22 seconds in the 200m for the first time over his indoor career, scoring a 21.96 effort. In an interview afterward, he didn't realize how special the effort was. Tell me Dallin, how are you feeling? "I feel really good," Draper said. "I'm excited. I've never been No. 1 in the country, so that's cool." "Yeah, it was a surprise," he said. "I'm pretty sure it's just because nobody has run it yet." That only began Draper's breakthrough season. 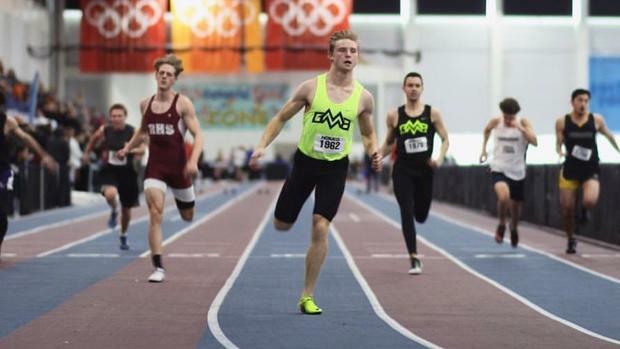 He didn't lose in any race over the next month and a half, scoring wins in the 60m and 200m at the UHSTCA Indoor Championships and at the Simplot Games. He even lowered his best 60m time to 6.76 seconds and his 200m best to 21.54, which stands as a current US No. 10 mark. Draper says his strength comes from his mechanics out of the blocks. He generates his explosive power by pushing off his right foot. "My start is good because I've been really focused on heavy deadlifting lately," he said. "So exploding out of the blocks and staying low has helped. I've put more time into the blocks then ever before. I can hit my top speed real fast." Draper believes his last test is going up against performers from all across the country, including DeMatha (MD) High's Brendon Stewart, Dock Mennonite (PA) High's Austin Kratz, Bullis School's (MD) Eric Allen Jr., and MGX's (FL) Tyrese Cooper. And then there's Okheme Moore, another breakout star in 2018 from Hillcrest-Tuscaloosa (AL). The pair have found a friendship through mutual respect this indoor season. Once Draper hit 6.79 in the 60m this year, Moore reached out to him on Twitter and offered his congratulations. Moore eventually surpassed it on Feb. 11 in 6.73. Draper did the same, extending some love on Twitter. Moore hasn't been to New Balance Nationals Indoor, either. So the duo will carry similar experiences into the national meet. "We've definitely [kept] in touch," Draper said. The only thing left for Draper, perhaps, is to show what he's made of in New York. He says he's not going to get carried away with the moment, either. "Honestly, I want to enjoy the experience and live in the moment and have fun and enjoy," Draper said. "But I really want to be able to channel the energy from the experience and focus on my race and perform to the best of my abilities at the meet." Soon enough, he'll find out.